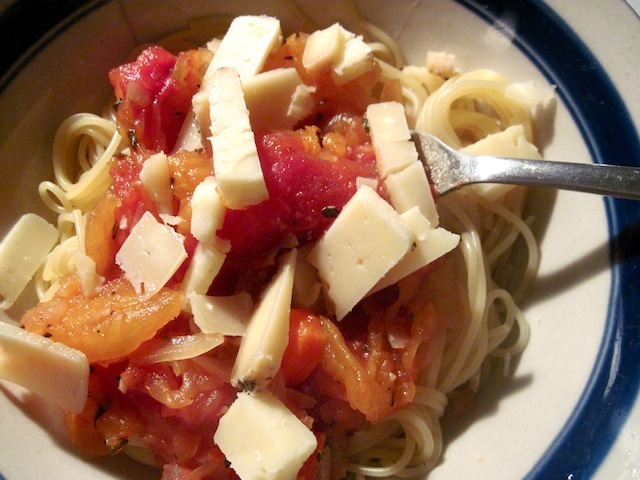 Comfort Food and Pumpkin Things: Pasta with Tomato and Pumpkin – Eat Me. Drink Me. I haven’t written about comfort food in a while. Although this is probably entirely untrue, since I was once accused of describing all foods as comfort foods, after which point I decided that food, for me, is comfort. I wasn’t even going to make dinner tonight and just settle for the baguette with brie and a cappuccino that I snacked on a while ago while writing an article. But I got some bad news today, and bad news always makes me crave tomatoes. And, oh, the news is so tedious and repetitive (let’s just say it involves creepy crawlies…) that I don’t want to talk about it. But I do want to talk about this brilliant little tomato and pumpkin pasta. We’ve been having a lot of fun with pumpkins here on Starr St. I bought a misshapen monstrosity at the grocery store the other night and scooped out all the flesh and Anette carved a very Matisse-esque design in the shell which lasted one whole candle-lit evening before the morning evinced a crumpled pumpkin looking like nothing so much as the old woman without teeth who sits on the stoop down the street. I made a pumpkin curry and pumpkin pie and roasted pumpkin seeds, and I still have enough pumpkin to last through the winter. 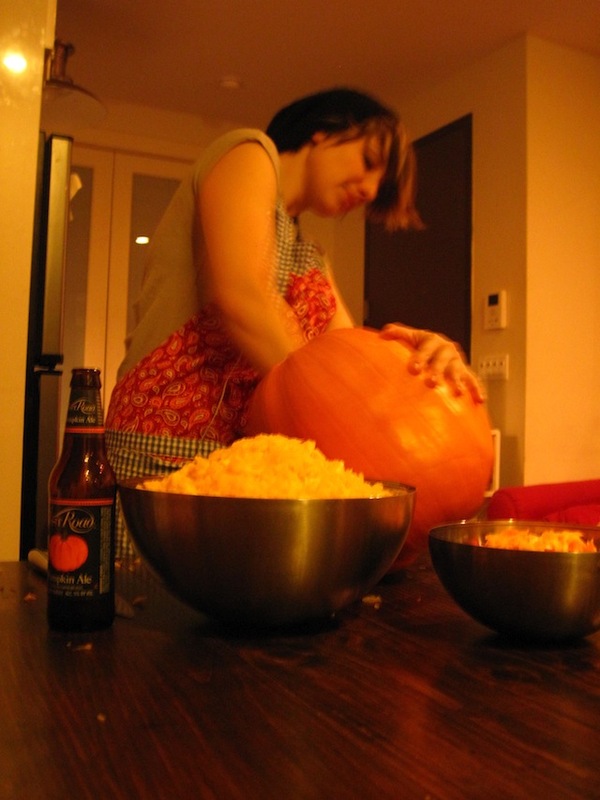 One pumpkin is a lot of pumpkin. So tonight, I made a pasta sauce with pumpkin, whole peeled tomatoes, carrots, onions, garlic, oregano, basil, salt, and pepper. Served over angel hair pasta and topped with chunks of black peppercorn-encrusted creamy parmesan cheese. Things are looking up already. Set a large pot of salted water to boil. In a large skillet, sauté onion and garlic in a bit of olive oil until translucent. 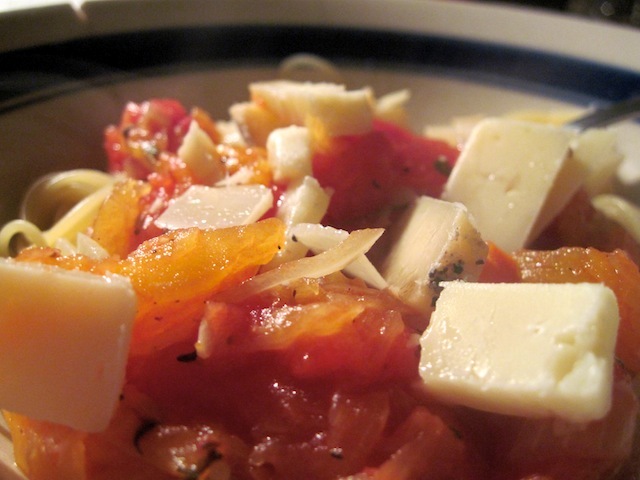 Add carrots and cook until soft, then add pumpkin and tomato. Season with basil, oregano, salt, and pepper, and simmer over medium heat for 10 minutes. When water boils, add pasta and cook until al-dente. Drain and top with sauce and grated parmesan. Your youngest brother LOVES pumpkin,too. Mom made him a pumpkin roll yesterday. You might consider that. When you were small (under 4) your Mama used to just cook the pumpkin custard in a dish and you would gobble it down. Me, too. This pasta sauce sounds sooooo good! Thanks for the suggestion.